A remodeled kitchen with stainless steel appliances and gleaming white cabinets set the tone for this immaculate home. Remodeled bathrooms, updated furnace and A/C, recently replaced roof, updated flooring, and vinyl window replacements are some of the other upgrades. 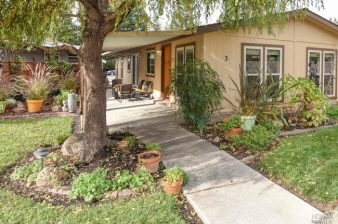 Add a private patio with beautiful landscaping and a prime location on the park's perimeter, and you have a golden opportunity for a classy, affordable home in St. Helena.